Starting with early experiments and pre-war visions of space and other civilisations, we’ll move on to films produced during the Space Race and the Cold War, and finish our exploration with parodies and genre spoofs of the late Soviet era. The first cinematic space trip Soviets made was to chase down bourgeois who, in fear of proletarian power, fled to the Moon. Interplanetary Revolution is an animation with some really crazy visuals, comparable only with Vertov’s Soviet Toys. It is known as a prologue to the famous Aelita (1924), usually accompanying the film on DVD releases (watch here). Protazanov’s Aelita must be the most known Soviet sci-fi film and the first full-length film about space travel. Its mysterious “Anta…Odeli…Uta…” is “Klaatu barada nikto” of Soviet cinema. Cosmic Voyage is an absolutely hilarious movie about a lunar mission, in which an old professor, his pretty female assistant and a school boy spontaneously take a trip to the moon in a space ship named “Josef Stalin”. Curious thing about Cosmic Voyage is that Konstantin Tsiolkovsky himself was the scientific consultant for the film. Tsiolkovsky is a major name in the Soviet space exploration history, and although he spent most of his life living in a log house 200 km from Moscow, his works inspired a lot of space engineers and became a solid basis for Soviet space programme. Now you might know it as Battle Beyond the Sun, because Roger Corman acquired the Soviet film and assigned Francis Ford Coppola, at that time only a young film student, to “westernise” it for US distribution. The film was re-edited, dubbed and freed from anti-American propaganda. Coppola even directed a couple of action sequences to spice it up. This film about a mission to Mars was made when the USSR was obviously leading in the Space Race – two years after the launching of Sputnik 1 – the world’s first artificial satellite, and two years before Gagarin’s mission. To celebrate the success Americans in the film are portrayed as douche bags. I don’t know how true it is, but some sources state that Stanley Kubrick used some stylistic ideas and production sketches from The Sky is Calling in his 2001: A Space Odyssey. Planet of the Storms is surely my very favourite Soviet sci-fi flick, mostly because of its set design: it amazes me how ingenious the creators of the film were in representing Venusian flora and fauna. This Soviet film about Venus expedition faced the same destiny and served Corman as material for two films: Voyage to the Prehistoric Planet (1965) and Voyage to the Planet of Prehistoric Women (1968). In this case Mamie Van Doren and a bunch of semi-naked Venerean (venerial?) Amazonians served as an element of spectacle. This film was intended to be the first instalment of a series of films set in future, when the Earth is united under one government, and is actively conquesting the space. The remaining parts were never filmed due to the director’s death. Nevertheless, there are so many awesome things about it: characters use devices that look like laptops and droids that look like earlier models of R2-D2 from Star Wars, and the film itself from time to time looks like Leni Riefenstahl had something to do with it. This duology belongs to the subgenre of “kids-in-space” that became quite popular in the 1970s. 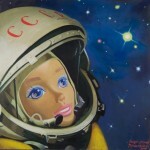 I guess that due to enormous celestial distances, somebody in scientific circles dropped the idea that perhaps children should be trained as cosmonauts and sent on missions when they are still young, so they could reach far destinations in space as mature people in their prime of life. In this connection the duology is obviously concerned with the ethic side of the question, but also spends a lot of energy on glorifying the cruel means and showing that they serve a noble purpose. Those of you who fancy Tarkovsky will most likely find To the Stars by Hard Ways a visually rich and pleasant cinematic experience, highly influenced by the director’s poetic naturalism. But the best thing about this film is its main heroine Neeya – a humanoid of ethereal beauty from the planet Dessa, played by a stunning model and actress Yelena Metyolkina. Don’t you agree? Connoisseurs will tell me that Kin-dza-dza is far from being a film about space travel. Well, you have the point there, but the film still features elements like pepelatz (an interplanetary space craft) and gravitsapa (a component for the pepelatz which allows travelling to other galaxies), and its action takes place on the planet Plyuk in the galaxy Kin-dza-dza. That is why I think the film deserves to stay in my top, even if on a deeper level it is a clever social parody.